I am trying to locate "Pavillion" Dinnerware made in Portugal. HORCHOW carried the pattern for only 1 year and has now discontinued it. I have called REPLACEMENTS, they too have yet to obtain it. 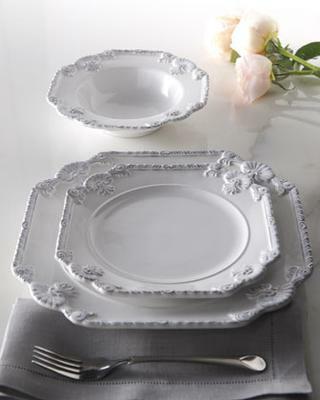 Not sure how to find or contact Portugal companies that make dinnerware. I would certainly appreciate any help possible! I hope to UPLOAD a picture of the dinnerware to give you an idea of what it looks like. Thank you! That is a beautiful pattern, thanks for posting. I have searched and I can't find it available anywhere. Neiman Marcus used to carry it, but they have discontinued it. It looks like it was a pretty exclusive item which is often the case with imported, hand-crafted dinnerware. Your best bet would be to keep an eye on second hand outlets like eBay, estate sales, liquidation companies, etc. You might try contacting Neiman Marcus or Horchow to see what they do with broken sets, like if they sell such items to liquidation companies. That might give you a place to start. I will keep my eyes open and post here if I happen to run across the pattern. The best to you in finding replacements for your beautiful set.